France’s Euro 2016 kit looks like a pair of blue pajamas. 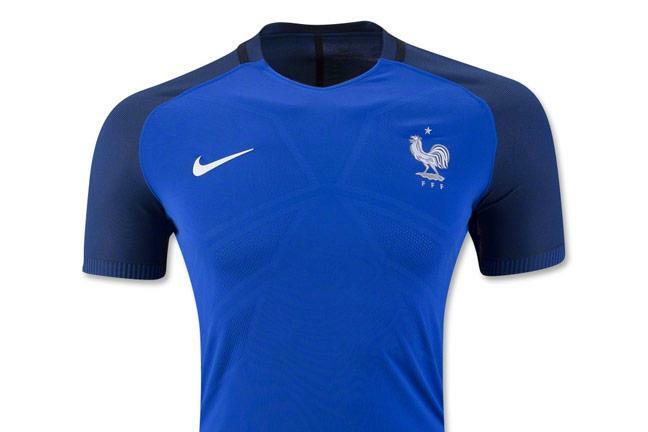 France’s home jersey for the 2016 European Championship looks similar to Italy’s Azzurri. If you live in a major metropolitan area and you walk, take public transportation, or enjoy day-drinking, there’s a good chance that you will see someone, probably a young-ish man, possibly with a beard, wearing a soccer jersey in the next few weeks. For some, wearing a soccer jersey in public has a symbolic significance; it tells the world that you support a certain team, and depending on the vintage of the kit, it can signal how long you have been a fan. Most national and club teams change their shirts yearly, which makes perfect sense in this most capitalistic of world sports. This year is no exception, with sportswear giants like Nike, Adidas, and Puma, as well as upstarts like New Balance and old stalwarts like Umbro, issuing new uniforms for the 24 European and 16 American teams playing in the Euros and Copa America. And as more U.S. citizens identify as soccer fans, expect to see more and more shiny polyester on the streets. I have the good fortune of living in a neighborhood that’s home to a store that will likely supply a large number of these jerseys. Upper 90 opened six years ago on the Upper West Side of Manhattan, and in that time has been so successful that it doubled in size, taking over the space of a car-service dispatcher that was doomed once Uber came to town. During the rest of the year, this is the place to go if you are looking for soccer shoes for your Sunday league game, or more likely for your kids, and the floors are stocked with shorts, sweatshirts, hats, and jerseys of popular European club teams such as Barcelona, Chelsea, Bayern Munich, and in particular, Arsenal. If you were to walk in to Upper 90 tomorrow, you could still find the latest Arsenal, and for some reason Borussia Dortmund kits, but most of the rest have been replaced by the national strips of teams playing in this year’s tournaments. I asked some of the many young salespeople working at Upper 90 if business is any different in cup season. The consensus answer was: not yet, but they expect it to pick up. After the Copa began last week, more customers have come in looking for national team shirts. The U.S. is popular, despite its forgettable shirt—especially forgettable, that is, when compared with this—but Mexico and Colombia shirts are also selling briskly. European team gear is not as popular yet, but the store expects to see more sales after that tournament starts on Friday. Based on the calls they have received so far, France, who is hosting the Euros this year, is poised to sell a lot of shirts to Americans. As one salesman commented, “The French, they always have style.” In the past that may have been true, but this year’s France kit, made by Nike, looks like a pair of blue pajamas, or even worse, a little too much like Italy’s. That a store like Upper 90 can thrive in the age of internet shopping is a surprise, especially when it isn’t even allowed to sell gear from all the teams playing in the tournaments. For some teams, like Romania, this is because the store doesn’t have a distribution deal with the kit manufacturer, in this case Joma. Upper 90 did manage to score some Albania jerseys manufactured by the Italian company Macron. Apparently this is because the store’s owner knows a guy who has a connection, and it’s a good thing, because they are fielding at least three calls a day from fans looking for the red jersey with the black double-headed eagle. (Eagles, with one head or two, are a popular motif this year, appearing on the crests of Russia and Austria as well.) Upper 90 stocks some of the more obscure jerseys from teams like Bosnia and Slovakia, but a number of popular shirts are unavailable. Clockwise from top left: Belgium’s patriotic flag jersey, Croatia’s distinctive checkered kit, Romania’s flashy yellow uniform, and the United States’ boring jersey. According to one staffer, Nike is not shipping certain teams’ kits to retail outlets, reserving them for sale online. One of the most popular jerseys that seems to be available exclusively online is Poland’s, an irritating fact to the folks at Upper 90 who have to turn away customers, and to denizens of Greenpoint. Even more disappointing, at least for soccer fans with more adventurous fashion sense, is the absence of shirts from Turkey and always distinctive Croatia. This is a new policy, since the red-and-white checked strip featured prominently in the store window during the last World Cup, although it’s not often seen in the wild, or on the Upper West Side. The salespeople I talked to were somewhat sanguine about Nike’s decision, though they were as surprised as I was that Nike would miss a chance to sell its products as widely as possible since every uniformed fan is a walking advertisement for the company. Over the next month, don’t be surprised by the brightly colored technical fabrics adorning the backs of fans and poseurs alike. If you feel up to it, ask about the shirt; soccer fans love to talk about their obsessions. But be suspicious of the bearded, bespectacled hipster rocking a bright yellow Brazil shirt. And if you see anyone sporting this, run the other way. Read more Slate coverage of Euro 2016.